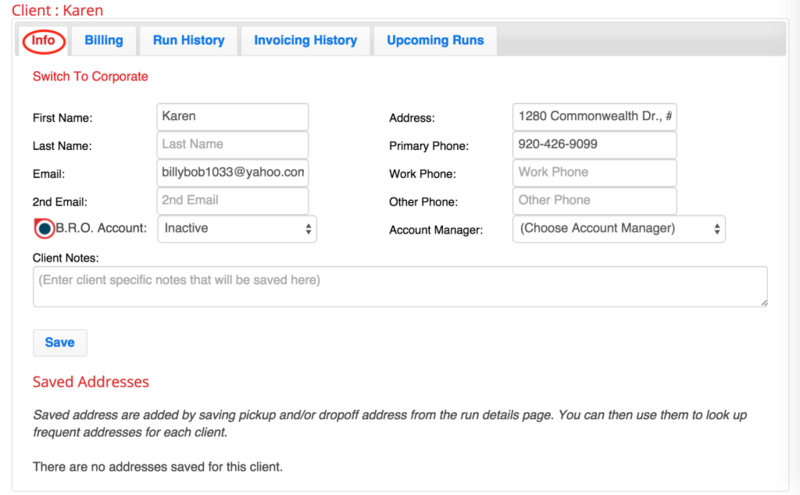 To edit an existing client’s contact and billing information, first go to the “Clients” page. You will see two tabs; one for individual clients and one for corporate clients. Find the client you need to edit. To the right of their name you’ll see the option to make them a VIP, see if they have an active or inactive BRO account and delete the account. To the left of the client’s name, you’ll see an edit wheel icon. Click this to open up your client’s profile. 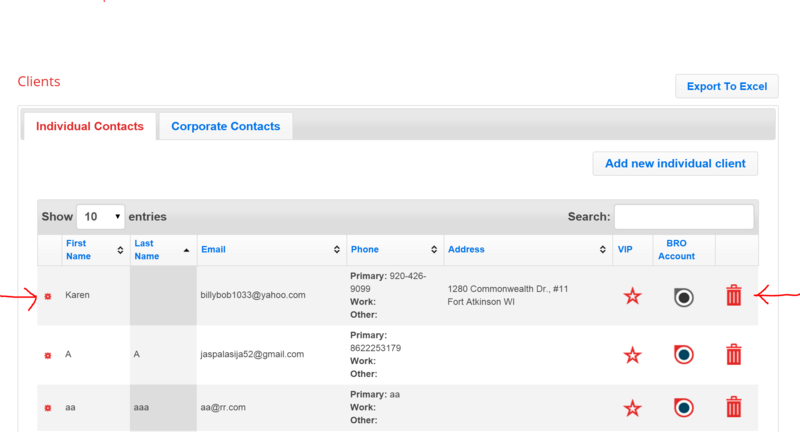 Under the first tab you can edit a client’s basic contact information: name, phone number, address etc. For corporate clients there will be another field at the top of the form that allows you to put the Business Name in. To use our system to its fullest potential, put a business name in and the main business contact. You will be able to add the passenger or passengers that you drive for this business on the tab marked “Corporate Contacts”. 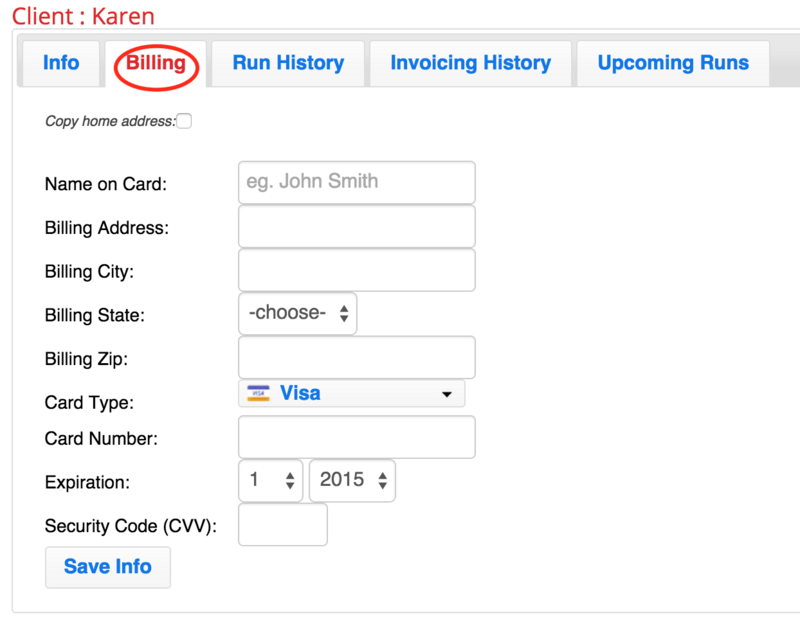 The second tab allows you to add or edit billing information for your client. If you are adding billing for a corporate client, this will be the company card. You can also assign a separate card to each passenger under a corporate client in the tab marked “Corporate Clients”. Please note: You can only add billing information if you have set up your merchant account with us. See our tutorial on Setting Up Your Merchant Account. The next tab is marked “Run History”. This will show all the past reservations that the client has booked with you. By default, all unpaid trips will show first. If you’d like to view all past reservations, uncheck the box in the upper right corner shown here by the red arrow. The next tab is marked “Invoicing History”. This tab interacts with our Invoicing feature. If you’d like to know more about this, see our tutorial on Invoicing. Corporate Clients will have an additional tab that you can add/edit information with. It is labeled “Corporate Contacts”. This tab allows you to add any and all passengers you drive for the same business. This may be one client or many. You can use the red arrow to the left of each passenger to add/update their personal information as well. Each passenger can have their own information saved under their profiles including different billing if needed. The last tab to appear for both individual and corporate clients is the “Upcoming Runs” tab. This tab simply allows you to view all upcoming reservations that have been booked for this client. Need to know how to add a new client? See our tutorial on Adding New Clients. © 2015 Book Rides Online All Rights Reserved.